Greetings friends! As I type this some of you are signing off for the day, while others are just waking up. 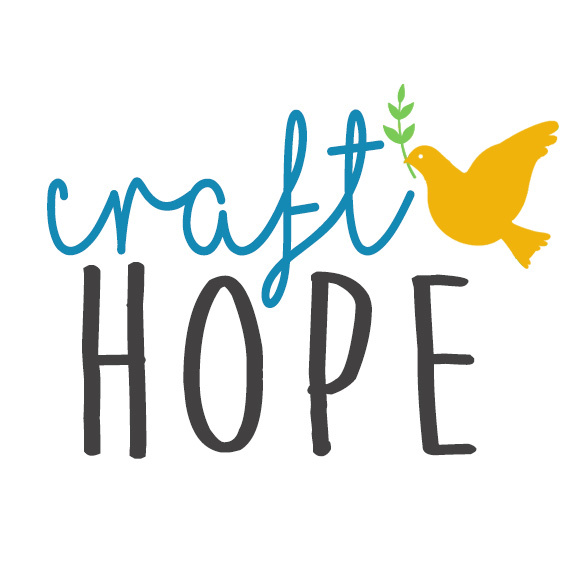 I love that Craft Hope is made up of individuals around the world and we are able to touch lives in far corners of the globe. The group of people that make up Craft Hope is just as diverse and each individual brings with them their own stories. Stories of hope, survival, triumphs, and failures. Some wear their scars on their sleeves, while others keep them hidden and find passion in helping others silently. A story that resonates with me is the story of adoption and foster children. The sweet letters I receive from mamas of just why a project meant so much to them. The homeless child. The parents who were unable to have a child of their own. The sense of a loss of hope. The restoration of that very hope. I get many emails asking how we choose a particular charity. Quite honestly, it just somehow all works out. Many of the charities come directly to us, through an email asking for our assistance. Many of them holding onto a sliver of hope that we can help them. That we could just consider working with them. I am honored and humbled with each and every request that goes into my inbox. Each one read over and over again. Many times filed, for the appropriate project and occasion. Not a one overlooked or dismissed. Here we go! Consider Project 7 officially launched as we are spreading HOPE in Liberia, West Africa. I, personally, didn’t know much about Liberia and have spent a good portion of the afternoon doing my research. Maybe it’s the teacher in me, but I want you to look it up. Google it. Go see why we are needed there. Opening your eyes to the current situation in a country certainly changes your perspectives. And the beauty of Craft Hope is that it not only changes lives in the areas we are helping, but also changes the lives of those doing the giving. This time we have partnered with the Liberia Orphan Education Project (LEOP) to provide school supplies to orphan schools in Liberia, West Africa. The LEOP started out seven years ago simply by sending crayons to Liberia and they now currently provide school supplies, teaching instructional supplies, and teacher training to these schools. The founder, Beth, sent me a sweet email asking if we could make bean bags to send to the schools. Heck ya we can! The specific type of bean bags they are needing are the same ones found in educational resource catalogs. Bean bags with letters, numbers, colors and pictures, bean bags in animal forms and shaped as geometric figures are all available in the educational materials catalogs. These bean bags are incredibly pricey, however relatively easy to make. One of the things that I immediately realized with this project is that it is a great group activity. They need full sets of the alphabet, numbers, etc. So please spread the word to teachers and groups who may be interested. If you don’t have a group, please connect with other Craft Hope members on our Facebook page. Or if you are feeling ambitious, please create a full set. Only full sets will be accepted. There are specific requirements for this project since it is an educational tool and traveling to West Africa. And we have big goals this time. We are hoping to collect TWENTY SETS of each. That is, 20 sets of Alphabet bean bags, 20 sets of Shape bean bags, 20 sets of Color bean bags, and 20 sets of Number bean bags. You can see examples of what we are talking about if you click on the links in the previous sentence. Also, because of shipping and customs issues we cannot accept bags filled with rice, beans, popcorn, or other food products. Plastic pellets, aquarium gravel, or other non-food stuffing is necessary. Number Bean Bag Sets: All bags need to be the same color so children learn the numbers printed on the bag and not begin to identify the bag color instead of the number (ex. child ”reads” the red bean bag as “3″ only because it is red and not because of the “3″ printed on it). If all number bags are the same the child will see the difference in the numbers and not the difference in the colors. Alphabet Bean Bag Sets: Any colors are great. Letters can be either upper or lower case or both but might be best if a standard font or style is used so that the letters are easily identified by little ones. Of course, any other creative ways you can come up with to teach letters, shapes, numbers, and colors with bean bags will be gratefully received. Here are some bean bag tutorials to help you along… here, here, here, and here. The deadline for this project is May 15th. This should allow time for you to coordinate a group or make enough bean bags on your own. Please spread the word by posting about this project on your blog if you have one. Also, we have a button in the sidebar you can embed into your own site. We also just set up a Facebook fan page that you can also find in the sidebar. Become a fan to stay up to date on all of the latest Craft Hope happenings. And you can follow us on Twitter. And, and we have a Flickr group so please post your photos to this group. We’d love to see pictures of your group in action making the bean bags and the bean bags themselves. Thanks for all you do. You truly make the world a better place. Are the number sets supposed to be 0-9 or 0-20? The example link looks like 20. — We are happy to receive whichever set you can do. 0-9 can be used in the youngest grades while 0-20 can be used for the older children. Should we embroider the names/numbers/letters on the bean bags or could paint markers/applique, etc. be used? — Any way is fine as long as the paint is nontoxic.